This month I’m thinking of ways that small changes in our beauty regimes can make a big difference to how we look and feel. Top to toe, little tweaks in grooming can have a big impact. Let’s start…. In colder months we all need extra hydration for the skin. Come Spring, we want radiant skin that looks healthy. Between now and the warmer months two beauty buys will give you all your skin needs. Nivea’s Daily Essentials Express Hydration Primer is a quickly absorbed hydrating layer for dry or sensitive skin, €6.09. It provides a smooth base before makeup and acts like a buffer between your precious skin and the wind chill outdoors. FaceD Luronics CC Cream (€19.90) is a colour correcting skin care makeup that provides SPF 20, evens out discolouration and plumps with hyaluronic acid. The finish is natural, sheer and radiant. Two products, endless benefits. Another two tricks can totally change your appearance, changing your eye makeup or brightening your smile. Hands up who wears the same shadow week in, week out. Switch shades to suit the season, a new shade makes all the difference. Keep it easy and inexpensive with Rimmel London’s ScandalEyes Shadow Sticks. These chubby pencils of long wear colour are so simple to apply, remain in place all day long, and come in lots of great shades. Priced at €5.99, they are available 3 for 2 this February. A regular scale and polish will keep teeth and gums healthy, in between sessions you can keep food and drink staining at bay with an at-home remover. Pearlys Teeth-Brighten Weekly Powder contains green tea and sodium bicarbonate that effectively lifts away external stains. Wet teeth, dip your toothbrush into the powder and brush. Simple. Use 1-2 times weekly for a brighter smile, €14.99. To finish our February transformation let’s talk tan and hair. All over tan in Winter/early Spring isn’t necessary, but the upper body can benefit in a lift in colour. To save on moisturising and dressing time, choose a rapidly absorbing tan like TanOrganic Self Tan Oil, €24.99. Applied with a mitt the tan is hydrating on the skin no need for lotion. You can dress immediately after, and within a few hours have a super golden glow. It’s the perfect way to tan in colder weather. Finally hair, don’t let windy weather give you a bushy old barnet, especially if it’s coloured. Protect from wind, UV damage and heat styling with L’Oreal Elvive Colour Protect Shampoo and Conditioner. This duo will restore hair strength, give it shine, and most importantly make your locks feel super soft and hydrated. €4.99 each. Click the banner below to view more amazing offers available in-store and online this February at LloydsPharmacy. This might just be my favourite product ever, a bold statement, but let me explain to you the reasoning behind it. I have suffered from very dry skin for years, particularly on my nose and forehead. I have tried pretty much every lotion and potion going to combat it but nothing ever really improved it in the way I hoped it would. I was sick of my foundation going flaky during the day, and how dry my skin looked in general. 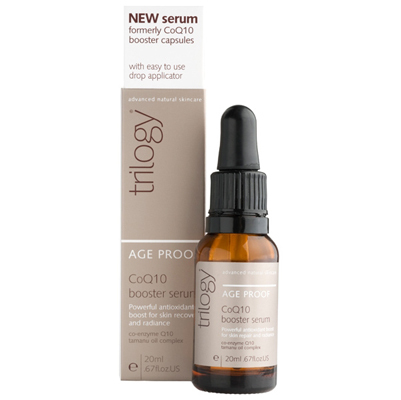 That is until I started using Trilogy Age Proof CoQ10 Booster Serum (€29.99). In truth I would describe it as more of an oil than a serum, but whatever way you want to describe it, it works. It comes in a small glass bottle with what looks like a medicine dropper on the inside. You can use this to put small beads of the product on your face to massage in. You really only need a small bit as a little goes a long way, and it smells quite nice. It doesn’t take long to apply and you can see it smooth out your skin as soon as you apply it. I started using it a few weeks ago, I put it on one night before bed and I can honestly say I noticed a big difference the next morning. My skin already looked a lot better, the dryness was already starting to go and it felt smoother than it normally did. Since then I have been using it every night before I go to bed and every morning when I wake up. I have noticed a huge difference already in the overall appearance of my skin. It claims on the bottle that in can reduce the signs of premature ageing and deliver a glowing radiant complexion. While I can’t vouch for the ageing claims as I haven’t been using it that long, I can verify that it delivers a glowing radiant complexion. I would highly recommend this for anyone who suffers from dry skin like I did, or just wants to give their skin a boost. My only regret is that I didn’t start using this sooner. I don’t think that this serum will ever leave my skin care regime.